When starting a bridge interface, NetworkManager waits for at least one port to enter the “forwarding” state before beginning any network-dependent IP configuration such as DHCP or IPv6 autoconfiguration. Static IP addressing is allowed to proceed before any slaves or ports are connected or begin forwarding packets. Click the Add button. The Choose a Connection Type window appears. Select Bridge and click Create. The Editing Bridge connection 1 window appears. Add slave devices by referring to Procedure 9.3, “Adding a Slave Interface to a Bridge” below. Select the Bridge connection you want to edit. Connection name — Enter a descriptive name for your network connection. This name will be used to list this connection in the menu of the Network window. Automatically connect to VPN when using this connection — Select this box if you want NetworkManager to auto-connect to a VPN connection when it is available. Select the VPN from the dropdown menu. Firewall Zone — Select the Firewall Zone from the dropdown menu. See the Red Hat Enterprise Linux 7 Security Guide for more information on Firewall Zones. The name of the interface to the bridge. One or more slave interfaces. The time, in seconds, a MAC address is kept in the MAC address forwarding database. If required, select the check box to enable IGMP snooping on the device. If required, select the check box to enable STP. The bridge priority; the bridge with the lowest priority will be elected as the root bridge. The time, in seconds, spent in both the Listening and Learning states before entering the Forwarding state. The default is 15 seconds. The time interval, in seconds, between sending configuration information in bridge protocol data units (BPDU). The maximum time, in seconds, to store the configuration information from BPDUs. This value should be twice the Hello Time plus 1 but less than twice the Forwarding delay minus 1. This property is a mask of group addresses that allows group addresses to be forwarded. In most cases, group addresses in the range from 01:80:C2:00:00:00 to 01:80:C2:00:00:0F are not forwarded by the bridge device. This property is a mask of 16 bits, each corresponding to a group address in the above range, that must be forwarded. Note that the Group forward mask property cannot have any of the 0, 1, 2 bits set to 1 because those addresses are used for Spanning tree protocol (STP), Link Aggregation Control Protocol (LACP) and Ethernet MAC pause frames. To add a port to a bridge, select the Bridge tab in the Editing Bridge connection 1 window. If necessary, open this window by following the procedure in Procedure 9.2, “Editing an Existing Bridge Connection”. Click Add. The Choose a Connection Type menu appears. Select the type of connection to be created from the list. Click Create. A window appropriate to the connection type selected appears. Select the Bridge Port tab. Configure Priority and Path cost as required. 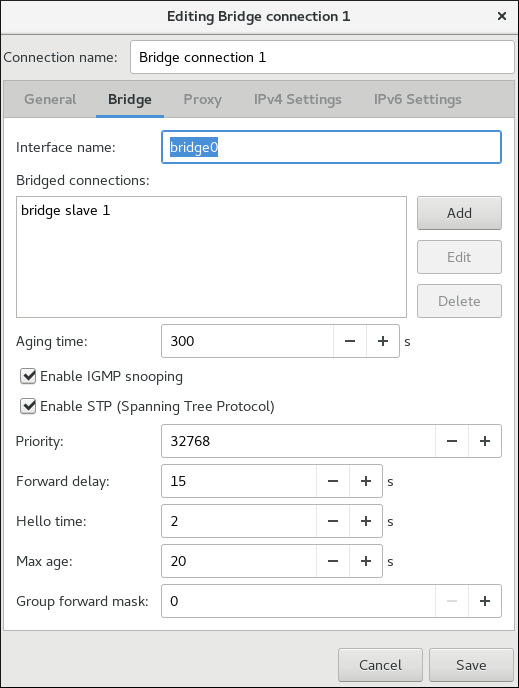 Note the STP priority for a bridge port is limited by the Linux kernel. Although the standard allows a range of 0 to 255, Linux only allows 0 to 63. The default is 32 in this case. If required, select the Hairpin mode check box to enable forwarding of frames for external processing. Also known as virtual Ethernet port aggregator (VEPA) mode. Once you have finished editing your new bridge connection, click the Save button to save your customized configuration. If the profile was in use while being edited, power cycle the connection to make NetworkManager apply the changes. If the profile is OFF, set it to ON or select it in the network connection icon's menu. See Section 3.4.1, “Connecting to a Network Using the control-center GUI” for information on using your new or altered connection. You can further configure an existing connection by selecting it in the Network window and clicking Options to return to the Editing dialog. 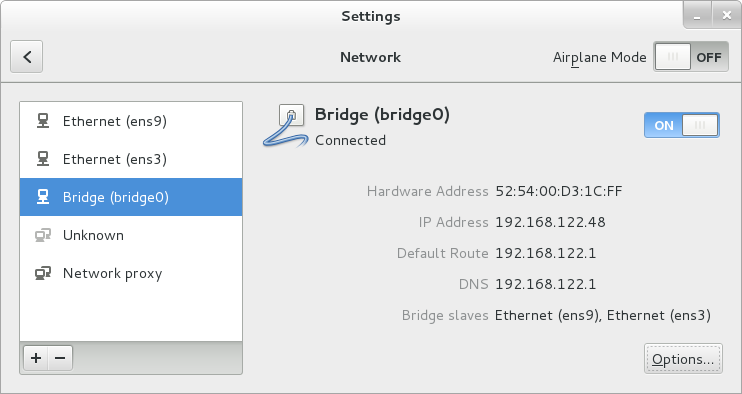 Once saved the Bridge will appear in the Network settings tool with each slave showing in the display.